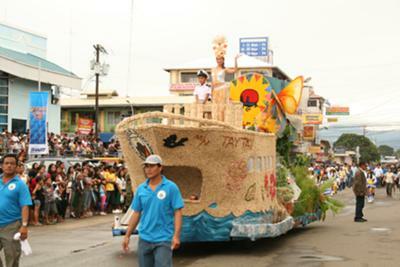 Shown in photo is the float of the municipality of Taytay, second prize winner in the Baragatan Float Parade competition in 2009. Once a year, the province of Palawan, the Philippines’ last ecological frontier, celebrates its biggest festival, Baragatan sa Palawan, from June 1 to 30, 2010. Baragatan which is derived from the Cuyonon word, bagat, which means “to meet,” is a gathering of people, culture, traditions and resources celebrating the beauty and bounty of the province. It is a grand celebration where one can experience Palawan under one roof, so to speak. It is a festival of Palawan’s natural and cultural heritage showcasing the beauty and bounty of the province in its people, agricultural crops, arts and crafts, tourism destinations, and environment. People from all walks of life including expatriates who have made Palawan their home, tourists and visitors are part of the Baragatan sa Palawan. According to the Baragatan Executive Committee headed by Ferdinand S. Dilig as Chairman, the festivities will begin on June 1 with a soft opening of month-long fairs such as the Garden Show, featuring Palawan’s greenery, blooms and other exotic plants, collectors’ items; Caraenan sa Baragatan is a food fair offering delicious and delectable meals, and for those searching for native souvenir items there’s the Technology Livelihood and Development Center Trade Fair featuring food products, arts and crafts of local manufacturers. The grand opening of the festival is on June 21 featuring the colorful Float Parade, Pantiguan sa Baragatan, a dance parade participated in by local officials of different municipalities, showcasing the festival in their respective localities and the officials. Also expected to add color to the grand opening is the streetdancing presentation participated in by officials and employees of the Provincial Government of Palawan. The festival also coincides with the 108th founding anniversary of the establishment of the civil government of Palawan on June 23. The anniversary will be highlighted with a Eucharistic celebration, the Governor’s Award, an award-giving body recognizing outstanding groups, institutions and individuals who have contributed significantly to the development and progress of the province, and The Best of the Best of Palawan Talents. Baragatan sa Palawan will culminate with the much-awaited Saraotan sa Dalan or streetdancing competition, tribute to former Provincial Government of Palawan officials and employees on June 27 and the Search for Mutya ng Palawan with the talent night on June 28 and the coronation night on June 30. These are all exciting and colorful events that Palaweños want to share to the country and the rest of the world. So come and visit Palawan and be part of the Baragatan sa Palawan festival. Date of Baragatan Sa Palawan? What is the scheduled date for the highlight of this festival, particularly the float parade? I wanna be here, in this festival! Looks like fun... It's like a Sinulog festival here in Cebu. Join in and write your own page! It's easy to do. How? Simply click here to return to Philippine Festivals.